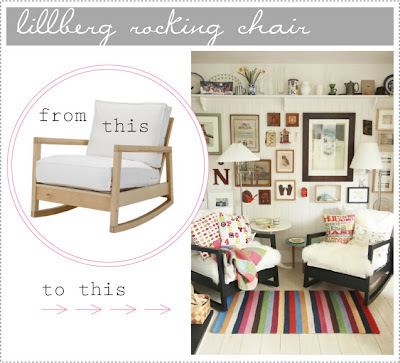 On my hunt for a rocker I came across this fabulous makeover of the IKEA lillberg rocking chair. Can you believe how great it looks in the after shot? I'm seriously inspired (and now with IKEA just 20 min away I'm set). The price is right...I'm just worried about comfort when it comes to the arms of the rocker...What are your experiences and or requirements when it comes to the perfect baby rocking chair? I have a glider with an ottoman which I love. The arms on mine are padded. They were very useful while I was nursing. Great support for the Boppy. Now my son is 2 and I don't use the arms so much for story time or cuddling. I do like the Ikea rocker. You could make pads in a coordinating fabric for the arms. Have the underside of the pads connect with a strip of velcro to be easily removed and washed! Good luck! I really like having padded arms on my rocker because...(long story) once upon a time when Z was an infant I was nursing at a friends house who didn't have padded arms on her glider and he got impatient waiting for the food arched his back and hit his little head really hard. That being said this particular rocker from Ikea looks like the arms are much farther apart and wouldn't be a big problem, I'd make pads or throw a blanket over the arms when using it. my only advice is make sure it is wide! you don't want to be bumping any heads while you are nursing! this one looks super cute! I never really had a nice baby rocker just the family room recliner or my wooden one which doesn't work for nursing unless I had pillows on it. But my Boppy pillow was my big friend and I nursed a lot while sitting on the bed or couch. If you have a Boppy pillow you can probably nurse any where! i'm not going to recommend it. in fact, highly NOT recommend it. i have chairs just like that, and i don't even like to sit in them alone, let alone nursing. first of all they are too deep, i always sit on them cross-legged. second of all, forget the hard, wooden arms. terrible for baby. and i never had a rocker. i always loved to nurse on a couch or bed with my knees up (that sounds weird). but i guess the only case these chairs would work in is if they are super wide, like mine, and you plan to not use the arms, if you're going to have a boppy or something (though i don't even know how those work. . .) anyway. i'm thinking keep looking. I get ridiculously excited when I see people do cool things with IKEA furniture. I wish I was that creative/brave/awesome! Love the rocker in the after pic. The whole room is to-die-for. It doesn't "rock," it doesn't glide, it bounces. It's super comfortable, you have an ottoman with it, if you want. It comes in different colors. I bought myself that one after Yves was born, and it's my favorite chair EVER! As far as the rocker goes: I sat in it just a couple of weeks ago, because it looks so cool, and I didn't find it very comfortable at all, it barely rocks (very little, awkward movement), and it is a very LOW chair. I really was not impressed with it. While I was pregnant I was absolutely commited that I had to have a rocker this time. We bought one and when I got it home I didn't love it enough and took it back and I have gone without. I think this one looks great. It looks wide enough that you could put a pillow next to the arm for baby to rest head on. I would make sure it is not too low to the ground to get up comfortably without disturbing baby. This post is probably really old and you have probably already decided. I really want a rocker for our next kid and this is the best one I have seen that is not $400. I used this rocker (the Ikea one) while nursing my son Joaquin who is now 17 months, and I loved the price and practicality of it. it is still in my bedroom and it works perfectly and goes with everything as it is white! 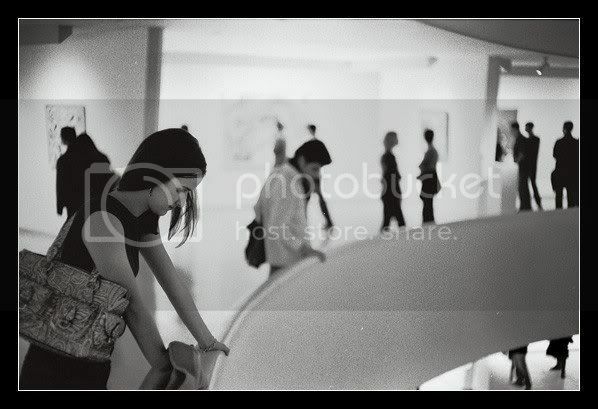 just came across your blog and i love your style! i wanted to know if you ended up getting this ikea rocker? we're considering it but weren't sure about the hard arms. please let me know if you got it and you like it! We actually never did get this rocker. I've heard this one works well if you are OK with the harder arms (you could drape a blanket/pillow over them if need be). We went with another one with padded arms and I'm glad we did because baby O nuzzles his face in the arms to go to sleep every night.